Within Windows 2003 Server Microsoft has added several new Group Policy Objects (GPO) settings to their product. The Terminal Server object is one of the subjects which got a lot of new settings. Before Windows 2003 Server you needed to configure your specific RDP settings via the Terminal Services Configuration on each server individually, but now Microsoft added these settings to the GPO’s. In this way you need to configure these setting only one time and all servers in the OU of that GPO gets those settings. Let’s take a look at these settings in a short overview with the GPO editor under Computer Configuration – Administrative Templates – Windows Components – Terminal Services. The most used settings can be found within the subfolder Client/Server data redirection and Sessions. Within the subfolder Client/Server redirection you can enable or disable lots of client redirections, like printers, drives and ports. Within the subfolder sessions the settings for time limit, disconnection and reconnection can be found. First of all why should you configure these Remote Desktop Protocol (RDP) settings on your Citrix Presentation Server, because Citrix is not using the RDP protocol but his own ICA protocol? There are several reasons why you want to configure RDP settings on your Citrix PS servers, but the most logical is that you do not want administrators connecting via RDP and redirect their local printers to your servers (remember that administrators always can install printer drivers with redirect printers) and/or consuming resources without doing any tasks on that server. With setting up your GPO RDP settings you can prohibit this behavior, so you setup for example the GPO settings “Do not allow client printer redirection”, “Set a time limit for active terminal sessions” , “Terminate sessions when time limit is reached” and/or other settings. After a while these settings are applied and some time later something strange is happening. Your Citrix users are complaining that their sessions are terminated and when they log in their printers are not available. As administrator you are going to trouble shoot your environment. When opening the Citrix Connection Configuration you are pretty surprised. Several settings are grayed out, which you normally can edit. If you take a closer look, you see that the settings you made still are in the right place. 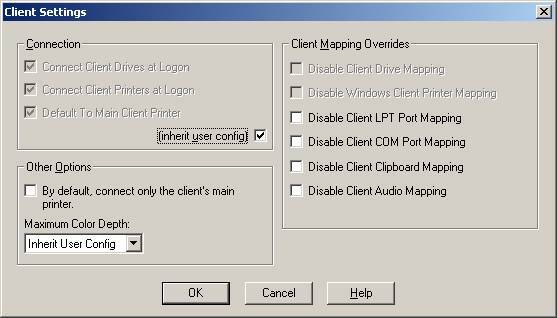 In our example, below in figure 2, the options “Disable Client Drive Mapping” and “Disable Windows Client Printer Mapping” are grayed out. But the options are not disabled as you see. So the Citrix sessions your users printers available on the local machines should be mapped into their Citrix session. In figure 3 you also see some grayed out options. All your connection settings are still default and a broken connection should be disconnect. But your users can not reconnect to their session so it looks like the connections resets. When you opens the Terminal Services Configuration utility to view your RDP settings you also see grayed out options. 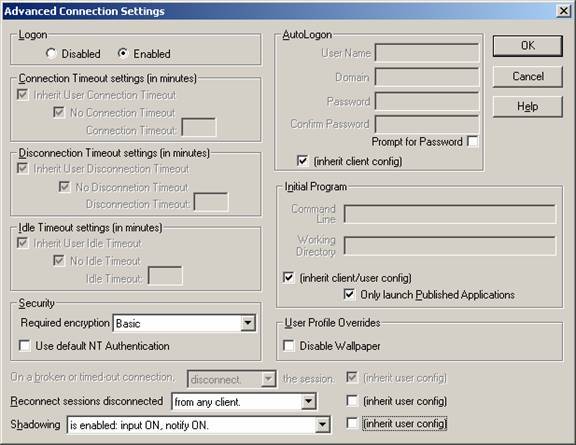 In a second you see this are exactly the same settings which are grayed out in the Citrix Connection Configuration Utility. You are now completely confused. Why is your environment showing this behavior? Rethinking which changes are made the only on you can imagine is setting the GPO settings for your RDP connections. At this moment you are experiencing how RDP settings via the Windows 2003 Group Policy Objects can harm your Citrix Presentation Servers. 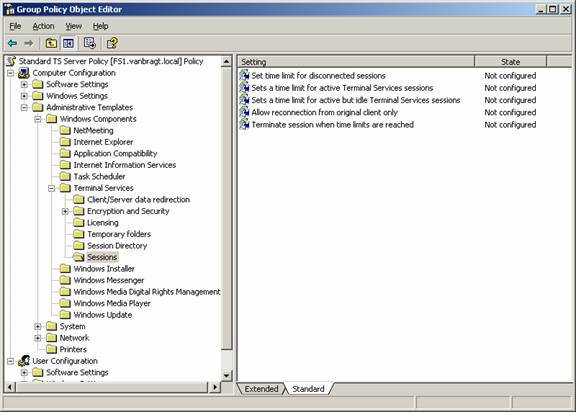 When editing the Group Policy Object for the settings on the Terminal Services tab, you thought you are settings these settings specific for the Remote Desktop Protocol. Logically Microsoft is providing Terminal Services via the RDP protocol, so if you configure Terminal Services settings within the Group Policy Objects that must be settings for the RDP protocol. But in some way it looks like that Citrix his Independent Component Architecture (ICA) protocol is using the same settings in spite of the settings configured within the Citrix Connection Configuration Utililty. All GPO settings are saved into the registry. Machine settings are saved in HKEY Local Machine part of the registry. If you take a look at the registry you will find that the normal place for ICA (ICA-TCP) and RDP (RDP-TCP) settings is within the key [HKLM]\System\CurrentControlSet\Control\Terminal Server\Winstation\. It is pretty easy to translate the shortname values in the registry to the corresponding setting within the Citrix Configuration Utility. Some examples fDisableCpm is Disable Windows Client Printer ,fResetBroken is On a broken or timed-out connection [reset/disconnect] the session or MaxConnectionTime is Connection Time Out Settings. The “check options” have a value of DWORD 0 (checkbox unchecked) or 1 (checkbox checked). The connection settings are DWORD, which can be counted back to decimal counters. A short check tells you that the values are correct corresponding to your configuration made within the utility. This behavior your are challenging is caused by the way Microsoft has implemented the Terminal Services GPO settings. The GPO settings are not directly set on the registry keys where the Terminal Service Configuration utility and Citrix Connection Configuration utility saving their settings (that is the place in the registry we just took a look at) but in a very different place in the registry. This Policies registry key has a higher priority then all other the keys. In this way these policy settings are overruling your special configured ICA settings (again which are saved in the subkey of the Winstation key). When configuring the Terminal Services GPO settings back to not configured you will notice that the options within the Citrix Connection Configuration utility are not grayed out anymore. Also your users do not notice that strange behavior anymore. Because Microsoft does not edit the RPD settings directly in the value but via the Policies registry key, causes that all protocols inherit these settings in that policy. In this simple way Citrix settings are overruled by this policy, which causes unexpected behavior when connecting to the Terminal Server via the Citrix ICA protocol. Because of this behavior the advice is not to use the GPO settings within Windows 2003 on a Citrix Presentation Server. If you would like to set these settings on central place the best way is to create your own ADM template which sets the RDP settings directly on the values within the Winstation key. Article previous published at MSTerminalServices.org.